In 1985, in his book Competitive Advantage: Creating and Sustaining Superior Performance, Michael Porter, outlined a set of generic strategies that could be applied to all products or services. 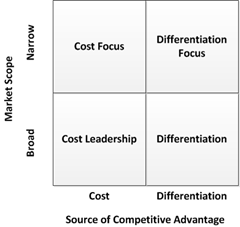 Porter called these generic strategies “Cost Leadership” , “Differentiation” and “Focus”. Cost Leadership corresponds to the “no frills” experience, like the low-cost airline carriers, who choose the cost leadership strategy to achieve competitive advantage. Differentiation, on the other hand, corresponds to the luxury providers, like Rolls Royce or Ferrari or Gucci, Armani or Prada. These companies provide uniquely desirable products or services to their customers. Focus is about market segmentation by offering a specialized product or service in a niche market. Porter later refined his model further subdividing the Focus strategy into two components: “Cost Focus” and “Differentiation Focus”. 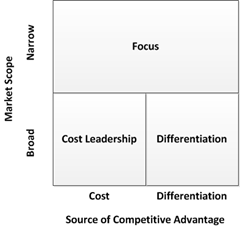 In this revised model, Cost Focus relates to emphasizing cost-minimization in a narrow market scope (niche market). Differentiation, similarly, is about increasing differentiation in a niche market. Pricing is a key issue if your company wants to pursue a Cost Leadership strategy as the target market scope is extremely price sensitive. A downside of the low-cost provider strategy is product price erosion, eventually leading to the product having to be retired from the market. Pursuing a low-cost strategy might leave a company vulnerable to the attack of other lower-cost providers, who can prevent you from increasing market share by undercutting your prices. Review your value chain to eliminate unnecessary (wasteful) activities. Cost strategies usually work best when there’s a fierce price competition among rivals, where the previous actions can be successfully put to work. If there is little product differentiation and supplies are readily available from several suppliers, companies can buy in bulk (e.g. whole production) at a discount price, driving down cost and opting for lowering retail prices (increasing market share by competing on price) or keeping prices and increasing margin. This is a common strategy for large food retailers that are supplied by local producers with small to medium productions. The greatest risk of pursuing a cost strategy is that it is fairly easy for direct competitors to follow suit as the ways outlined above to achieve cost reduction are not unique and are readily available given the same level of investment in driving down costs. One way to stay ahead of the competition in a relatively leveled playing field is to introduce continuous optimization of the production and value chain by introducing lean manufacturing techniques like Six-Sigma or Kaizen. Differentiation means making your products (or services) different from those of your competitors or more appealing to your customer base. This is highly dependent on your several factors, like industry, market, customer base, and the nature of the actual products or services. Whatever it is it has got to be something that makes your products or services stand out. Marketing and sales to create awareness and desire for it’s unique products. Companies pursuing a differentiation strategy can command a premium price for it’s products or services, eventually seeing increased unit sales due to the differentiation factor as well as increased buyer loyalty. Examples of the successful use of a differentiation strategy are Nike athletic shoes, Apple Computer, and Mercedes-Benz automobiles. A differentiation strategy is appropriate where the target customer segment is not price-sensitive, the market is competitive or saturated or customers have very specific needs which are possibly underserved. In any case, your company needs to have unique resources and capabilities which enable it to satisfy these needs in ways that are difficult to copy. Such resources or capabilities might include patents or other Intellectual Property (IP), unique technical expertise (a mix of individual talent and collective identity – e.g. Apple designs or Pixar animations), talented personnel (e.g. a sports team’s star players or a brokerage firm’s star traders), or innovative processes. Additionally, companies can also invest in brand management, resulting in an increased perception of a differentiated product, even when the actual product is the same as competitors (e.g. Starbucks coffee and Nike sneakers). This is rather common among fashion brands. The greatest risk for companies pursuing a Differentiation Strategy is the risk of attack by competitors pursuing Focus Differentiation strategies in different market segments. To mitigate this risk companies pursuing a broad market Differentiation Strategy need to have an agile product development process where constant innovation helps keep specialized players at bay. Focus strategies concentrate on niche markets. Companies pursuing Focus Strategies have a deep understanding of a particular market and the unique needs of it’s customers. They can therefore develop unique lower cost or differentiated products or services for that specific market. These companies usually have a very strong brand loyalty amongst their customers and tend to monopolize that segment (particularly in smaller markets), making it less attractive to competitors thus mitigating the risk of attack from other niche players, new entrants or broad market competitors looking to enlarge their customer base through product or service specialization. Narrow market strategies are similar to their broad market scope namesakes. What is key is that companies focusing on niche markets need to bring something new into the mix – something that adds value to customers in that particular market. Otherwise, they’ll soon be competing with larger, more resourceful and broad-focused companies. Limit production to specialized products for your target segment. Increase differentiation through innovation and your specialized knowledge of your target customers’ needs. A company has to spend time and effort to choose the right Generic Strategy, as this will support all other strategic options. The company needs to make a decision on which strategy to use and stay on it for the long term. It is simply not feasible to try out a particular strategy option. Michael Porter has specifically warned against attempting to “hedge your bets” by employing more than one strategy option, as every strategy appeals to different types of people and requires radically different approaches. Differentiation Strategy requires very outward-facing, communicative and creative approaches, while Cost Strategy requires a deep focus on internal processes and optimization in a profoundly analytical approach. Trying to employ multiple strategies, will typically render a company without any clear strategic advantage and in a poor strategic position. Such companies are bound to become low-profitable, second-rate companies due to ambiguous corporate culture, conflicting organizational structures and contradictory and ineffective incentive schemes. So, when choosing which Generic Strategy is right for your company, play to your company’s strengths. Cross-analyze the results of each finding and work out which Generic Strategy provides the strongest set of options.